uCoolz Mattress Pad uses Advance Semiconductor Technology to Heated or Chilled water in the tubing that passes through the mattress pad for heat transfers. It has forgone the use of Conventional refrigerants such as CFCs and HCFCs because of their ozone layer depletion potential. uCoolz Mattress pad is a green environment initiative that could potentially help to save millions of dollars used in constructing addition power plants and also cut on the rate of global warming. Minimum Maintenance: Unlike Air-Conditioners which require regular servicing by professionals, such as topping up gas, maintaining the compressor and cleaning of fan coil, uCoolz Mattress Pad do not use compressor like conventional cooling systems. The only maintenance required is to clean the dirt caught in the fan and top-up water every few months. This does not require a professional, you can do it yourself. uCoolz Mattress Pad uses less than one tenth of the energy as compare to a normal air-conditioner. Typical power consumption for a normal air-conditioner that cools a 16m² bedroom ranges between 1200W to 1800W. uCoolz Mattress Pad uses only 160W at the peak and only about 80W to maintain the temperature. Taking the average power consumption of an air-conditioner as 1500W and uCoolz Mattress Pad as 120W, this would mean S$3 saving for 8 hours usage per day based on current electricity tariff of 27.28c per kwh for Singapore household. This is a very significant saving on your utilities bills. You could even recoup your investment on uCoolz mattress Pad in just a few months to come. It is definitely a good investment and you also play your part in protect and save our environment and delay global warming. More Reliable: Since it uses Semiconductor Technology to heat and cool the water, mechanisms are kept to the minimum so as to lengthen the life of the heat pumps. Low Noise level: Noise level are kept to the minimum. With our current improved version, the noise generated during operation is less than 20dDA, much like the sound of a USB fan. 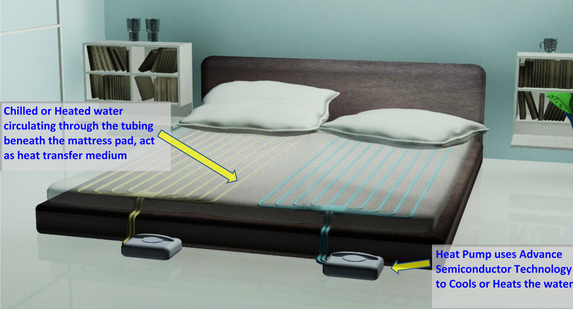 Versatile Operation: Besides cooling function, it is also able to heat up your bed up to 48°C during winter or for medical therapy. Portable: Small, light and can moved from room to room or even be used in a car with an inverter. uCoolz Mattress Pad come in two types: Poly Cotton Material and the improved version Bamboo Charcoal Cotton. Mattress Pad are specially designed with high water absorbent, quick drying and mold resistance which make it suitable for the use in high moisture areas. It can be placed under your bed sheet.